Blu Cleaning specializes in Clean Room Maintenance and we have the expertise required for cleaning medical manufacturing 100K (ISO 8) and 10K (ISO 7). We understand and have the equipment, procedures, and experienced personnel to properly clean ceilings, walls, floors, pass through and gowning room areas of clean rooms. For business expanding into medical manufacturing, we can provide the necessary janitorial support to ensure compliance. We also understand the documentation required with employee signoffs daily for compliance audits. 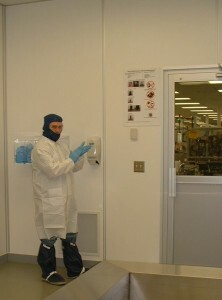 Gowning for clean room maintenance cleaning requires not only specific dress requirements but also specific procedures for how an employee gowns and wears rubber gloves, masks, hood coverage for some clean rooms as well as boots or booties. We can instruct our employees for proper adherence.